Because of the massive love she carried within it everything she did gave us all a feeling of safety, unconditional love, compassion.... home....but, now that my mom has been away from us for almost 10 years we no longer have a 'home' to go to....When a child no matter what age they are, loses both parents they have this horrible empty feeling inside, that of being an orphan..We think to ourselves, "OK, what now?, I am alone, I am an orphan" and I can tell you from experience it's got to be one of the most empty and lonely feelings I have ever felt before. When my husband and I moved south due to financial issue's I thought, it may be a good start.. Somewhere I can go and start over... All the pain I felt inside at the loss of my childhood so young, the loss of both of my parents, it might just get better if I wasn't reminded of it everywhere I went, everywhere I looked. Well, I wasn't here 3 months and I wanted to move back 'home'.. 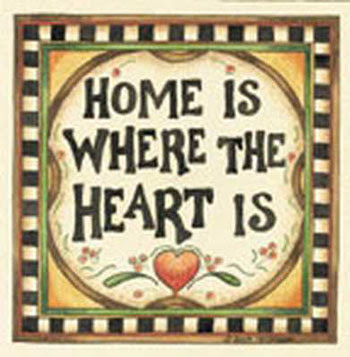 I am constantly saying, "I want to move back home' and then for some reason lately it hit me.. What is 'home'? As young children and teens, myself, my brother and my mom moved to four different houses in two different towns. Then I got older and moved into my own apartment in yet another town. Then I got married the first time and moved into a house in another town, I got divorced and moved again to another town. I remarried in 1998 and moved into 2 more houses in 2 different towns. So really, when I think about it the only home I can relate to as far as a house was the house I lived in when I was a little girl before my father passed away and that was only for the first 9 years of my life.